To deploy collaborative, Christ-centered teams of military and civilian people of faith to serve the world's most war-torn and impoverished nations. No Greater Commission, formerly Nation Builders, was born out of a passion to advance the Kingdom of God. “No Greater Commission” speaks to Jesus sending his disciples to be Fishers of Men; Matthew 28: 18-20 “Jesus came to them and said, ‘All authority in heaven and on earth has been given to me. Therefore go and make disciples of all nations, baptizing them in the name of the Father and of the Son and of the Holy Spirit, and teaching them to obey everything I have commanded you. And surely I am with you always, to the very end of the age.’” The vision for Nation Builders was inspired by Matthew 22:36-40, “‘Teacher, which is the great commandment in the Law?’ And he said to him, ‘You shall love the Lord your God with all your heart and with all your soul and with all your mind. This is the great and first commandment. And a second is like it: You shall love your neighbor as yourself. On these two commandments depend all the Law and the Prophets.’” Kurt and Sandy Parsons take this commandment to heart and have devoted their 21 years of marriage to loving and serving military families. While stationed at the U.S. Naval Academy, Kurt was blessed with the opportunity to work with young men and women who were interested in doing God's work and not just talking about it. Inspired by these men and women of action, Kurt and Sandy began to develop a vision for international missions work. Over the next several years, a small group of officers, midshipmen and civilians traveled throughout the world, actively seeking local pastors and leaders with whom they could build the Kingdom of God. While Kurt was in Afghanistan on a provincial reconstruction team in 2008, the team founded Nation Builders. Since then, Nation Builders has traveled to and supported fellow Christians in ten nations. Throughout their military and government careers, team members have worked in a combined total of over ninety countries. In 2015 Nation Builders changed its name to No Greater Commission (NGC) and began fostering a unique vision of seeing military-trained Christ-followers partner with civilian believers to serve the world's most war-torn and impoverished nations. Learn more about NGC through this interview Kurt and Charity did on the Point of View Radio Talk Show. A retired Naval Aviator and Navy Diver with 21 years of military experience, Kurt has received 41 different awards including the Bronze Star, Meritorious Service Medal, Combat Air Medal and Combat Action Ribbon. While defending the United States all over the world, his service has included both ground and aerial war-fighting in Afghanistan and Iraq. Additionally, Kurt is an ordained pastor, and is most passionate about sharing the love of Christ. Pete currently serves as a Senior Advisor for Platform Systems, Inc., bringing over 25 years of executive-level leadership in the aviation, engineering and technology fields. Pete has served as President/CEO, Vice President, and/or CFO for several successful companies including General Dynamics, Cessna and Mooney Aviation. Pete and his wife Judy volunteer their time leading bible studies and mentoring Midshipmen at the United States Naval Academy. The love they have for their neighbors and surrounding community is depicted through their continued ministry to others. Britt resides in Dallas, Texas and works for the U.S. Government. He carries 21 years of expertise in law enforcement, tactical operations, and investigations. Britt began his career with the Amarillo Police Department and has continued to serve in positions of public service. His career has given him countless opportunities to lead operations in 75 countries across the globe. Britt and his wife, Charity, and their families believe in the value of serving others before self. Their desire is to serve ministries across the globe with the talents God has entrusted to them. Charity has served as a military medical professional for 13 years. Her service to various populations across five continents created her drive to make a global impact for change in public health, with a special passion for the people of Africa. Charity has a master’s degree from the University of Cincinnati and worked with the Panamanian Ministry of Health at the culmination of her education in public health. Across varying people groups, she has recognized one continuing theme; to treat a person’s physical health can only assist them in this life. To reach them for a spiritual eternity is our greatest mission. Molly is an active-duty Naval Officer who balances her time between being a new mother, a wife to a service-member and serving as an Engineering Project Manager in the Navy’s Civil Engineering Corps. As a Mechanical Engineer and graduate from the United States Naval Academy, she is passionate about executing projects that improve the quality of life in conflict nations around the world. Involved in ministry and community outreach her whole life, she loves to serve Christ in the communities hardest to reach. Arianne has over 10 years of experience as photojournalist dedicated to using visual storytelling to reveal the strength behind the human condition in order to spark action. She received her Bachelor of Fine Arts in Photojournalism from the Corcoran College of Art & Design in 2006. She has worked for national and international publications such as The New York Times, The Washington Post, United Press International, Washington Examiner and more. Recently she has supported missions efforts through her photography in Honduras, El Salvador, and South Sudan. Denise comes to No Greater Commission after serving in multiple areas of child care. She earned her Bachelor of Science in Accountancy from California State University Northridge. During her final year in college she began volunteering at Children’s Hospital Los Angeles while completing her degree. As a weekly volunteer in the Hematology/Oncology clinic, she discovered her heart for working with children. Following college, she built a foundation in various child care capacities. God has afforded her the opportunity to work in foster care, early childhood education, and international missions. She has traveled internationally to various locations throughout Central and South America. Vicque graduated from the University of Northern Colorado with a degree in Education. She has 12 years experience as an educator and 19 years experience as a business owner. She currently owns her own company managing payroll and accounting for several Colorado based companies. Vicque is also a cancer survivor. Due to the nature of their (or their spouses’) active military service, the remaining members of the NGC leadership team are not identified at this time. For more information about these men and women please contact our public relations representative. In the war-torn land of South Sudan stands a beacon of hope. The Mission Gardens of Christ (MGC), the dream of Pastor Stephen Mathiang, represents the power and hope of Jesus to resurrect life and restore hearts. The MGC exists as a true light in the darkness in the undeveloped land of South Sudan, functioning as a training facility for pastors and missionaries as well as a school for adolescents. "Stephen’s story is remarkable. In a time of war, God supernaturally provided him with the opportunity to receive his education at Daystar University in Nairobi. He received a degree in business, a Master of Divinity and a doctorate in leadership. 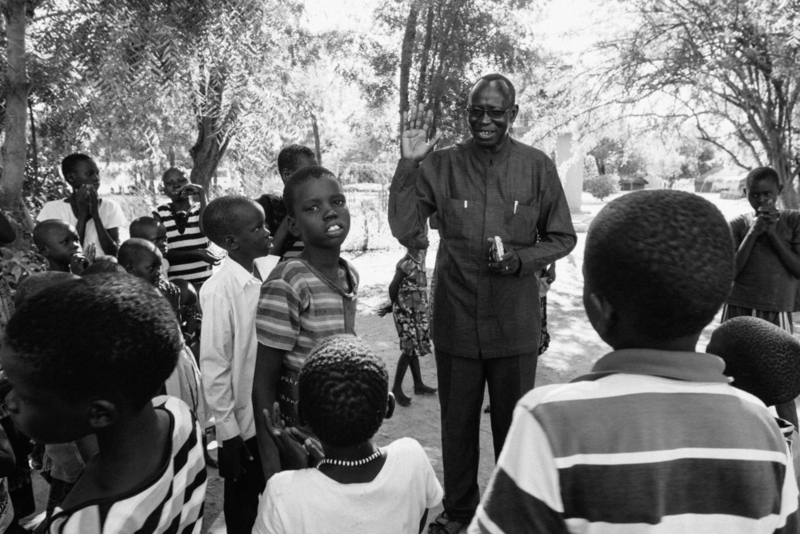 Returning to his country ravaged by war, he founded a nonprofit called Church and Development. Stephen began drilling wells to provide safe drinking water, building schools and training church leaders. He then had the vision for a training center that would equip pastors and church planters, educate children and youth, and provide vocational skills, a children’s home for the abandoned and a health clinic. Stephen started The Mission Gardens of Christ. The MGC represents the hope and power of Jesus to resurrect life and restore hearts. It is a light shining in the darkness of undeveloped South Sudan. For the last six years, Pastor Stephen has been faithfully constructing The Mission Gardens of Christ. Though the challenges and setbacks have been many, today stands classrooms, a dining hall, dorms, a library and an office building. We ask for prayers and donations to help further the effort in South Sudan. No Greater Commission is a 501(c)(3); all donations are tax deductible. Upon receipt of your donation, No Greater Commission will send a donation receipt to the email provided.